I am impressed by your self control at JoAnn Fabrics, don't know that I would have been able to maintain such control. But it paid off and you scored a nice roll of batting at a great price! I am very pleased with the quality of the batting, as well. =) I have never worked with it before. I would definitely buy it again. I shopped at Joann on Friday, after noon. I waited until the rush was over. I refused to purchase yardage, since I didn't want to wait in line to get my fabric cut. 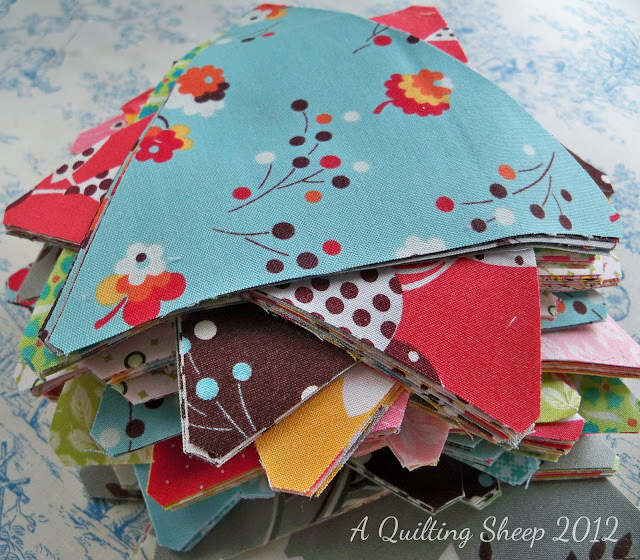 I did purchase some fat quarters, and another case for another sewing machine. Gee, $90 case for $22.50. My kind of deal. Can't wait to see what you are sewing. I bought a gift online about 9 pm Friday. Got a great price and no shipping. I was happy. That was the extent of my 'black friday' deals. Can't wait to see what you make with your triangles. Great deal on batting too!! I thought my deal was good for queen size warm & natural for $16 a piece. I missed JoAnn's until after lunch so I didn't get to use my additional 25% off. Sigh . . . I was tempted by that! Glad you snagged one! Amy I do the same thing. I am NOT good at math my husband usually has to help me and I cut and if I need more I cute more. But lately I have been cutting to much lol. Hope you are having a great week. That batting was a real steal! You lucky girl! Love triangles!! Can't wait to see your quilt! Good for you on the batting. I chuckled picturing ladies "moving quickly" toward the 4 rolls of batting! I try to avoid Joann's since I always spend money I don't have!